A few months ago, I was asked to collaborate on a very special birthday party from Jennifer Carver of Banner Events. 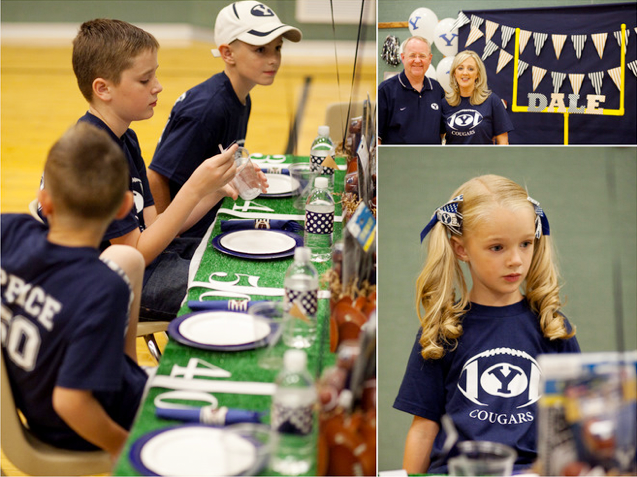 Jennifer's dad was turning 60 and she and her sister, Cami, wanted to create a spectacular celebration and surprise their dad with a BYU themed football party. And what a surprise it was!! With the help of so many talented ladies in the party business, Jennifer was able to make a memorable day for her entire family. This one is full of tailgating ideas and football party fabulous-ness so get ready for some fun! 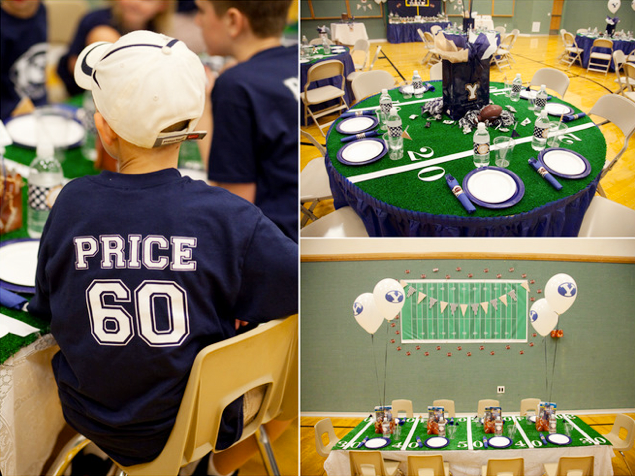 Inspired by Amanda's Football party table, Jennifer "took the ball and ran with it" creating a room full of fantastic football-themed tables. 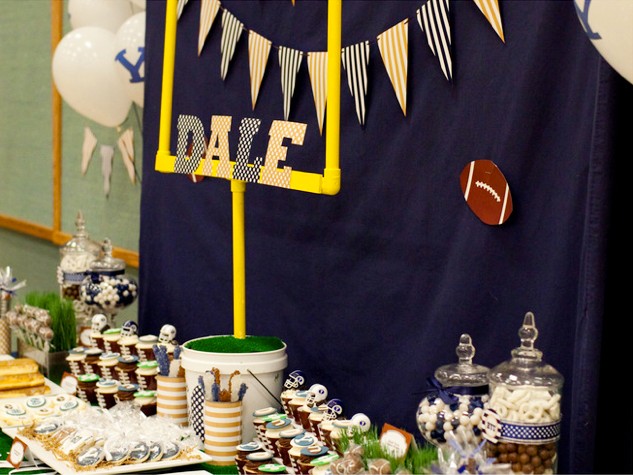 Using Amanda's FOOTBALL PARTY PRINTABLES COLLECTION, which is customizable to any team and team colors, was a terrific starting place for all things BYU her dad's college alma mater. Jennifer says, "The highlight of the event was definitely the dessert table. 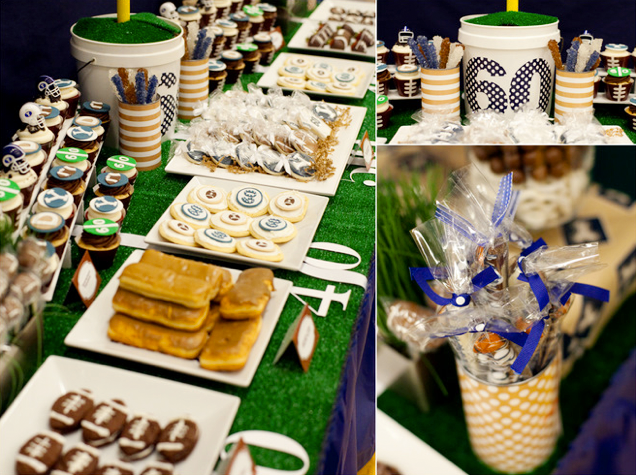 Decorated to look like a football field, with astro turf used as the table covering, the dessert table was the focal point of the party design. Striped pennant flags were hung using denim twine from The Twinery. 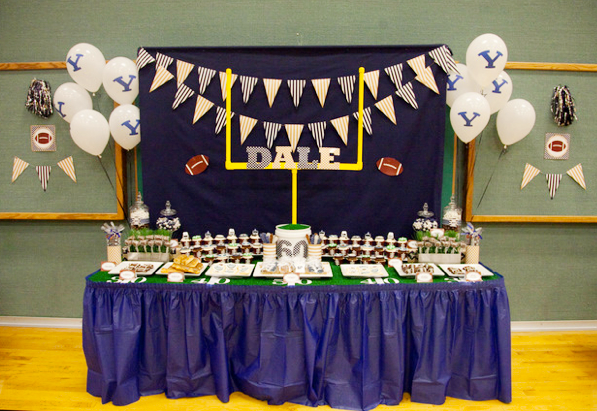 PVC pipe was cut, assembled and painted to look like field goal posts and held letters which spelled out the honoree’s name: DALE. 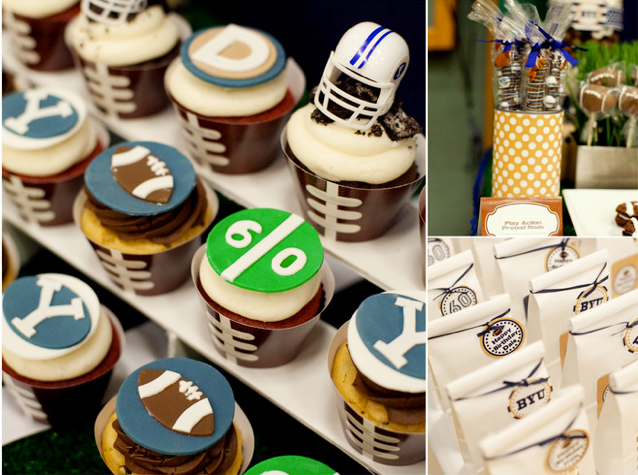 Bleachers were fashioned out of foam core board to house delicious ‘quarterback’ cupcakes from Cupcake Chic with custom fondant toppers by Two Sugar Babies. JP Creatibles outdid herself with the most stunning football cookies I have ever laid eyes on! 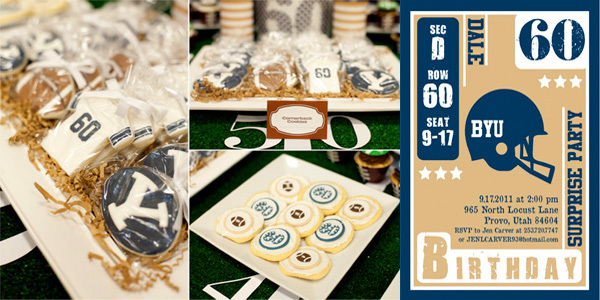 Footballs, custom BYU jersey and BYU logo cookies with the most detailed design work I have ever seen, were the talk of the party! 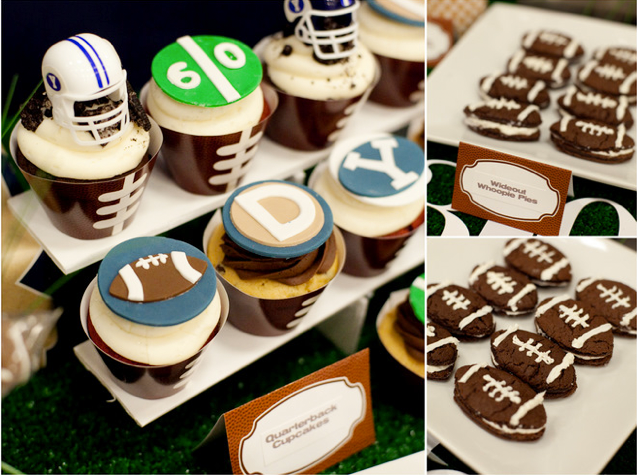 And football themed ’Cornerback’ cookies were iced and topped with gorgeous fondant cookie toppers crafted by Edible Details. Beautifully hand dipped and decorated ‘play action’ pretzel rods were prepared by Pretzels Pleaze. Notice the cute sugar footballs adorning the pretzels! No detail was spared! 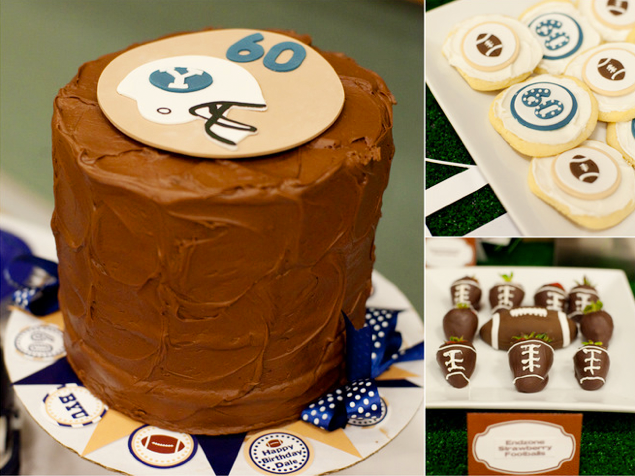 There where ‘wideout whoopee pies’, ‘blocker brownies’, ‘touchdown treats’ in apothecary jars, maple bar ‘cougar paws’, ‘goal time’ cake pops (lovingly created by Johanna Dellino of Pop.O.Licious Cake Pops), and more!" the perfect invitation to set the stage for the big event. Jennifer gives us a few more details.... "Adorable football boxes from Nashville Wraps helped house chips on the buffet table and fun party favors on the kids' table. Guests sat down to tables outfitted to look like a piece of the football field itself. Astro turf was cut to fit round tables. White ribbon and die cut numbers were glued on to look like yard lines and markers. 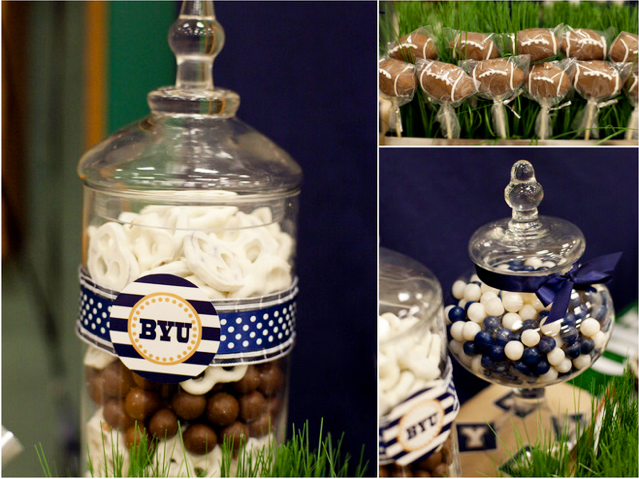 Centerpieces were made from coordinating college logo balloons, gift bags, pom poms, footballs and coordinating candy. A delicious 3-layer cake was displayed on its own table, topped with an amazing fondant cake topper by Two Sugar Babies. Strawberries were dipped in chocolate and decorated to look like their pigskin counterparts. One of my favorite details were the custom designed matching navy and white team shirts given to each of the honoree's immediate family members. With Cougars on the front and the honoree's name PRICE and 60 on the back, it was a fabulous touch to an already amazing party. 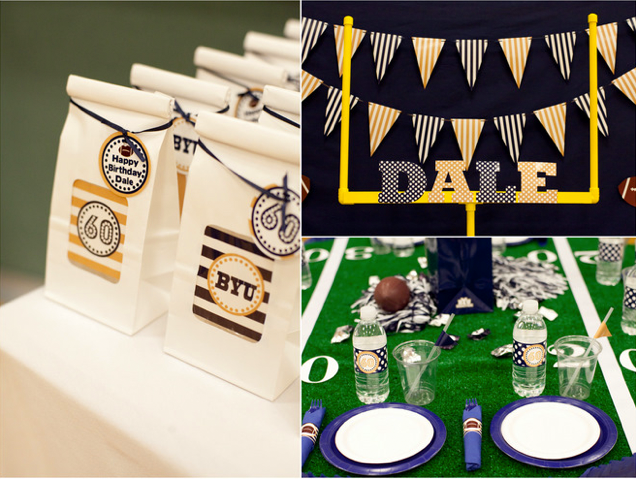 Guests were given a take home favor bag from Nashville Wraps adorned with BYU-themed printables from Amanda's Parties To Go. 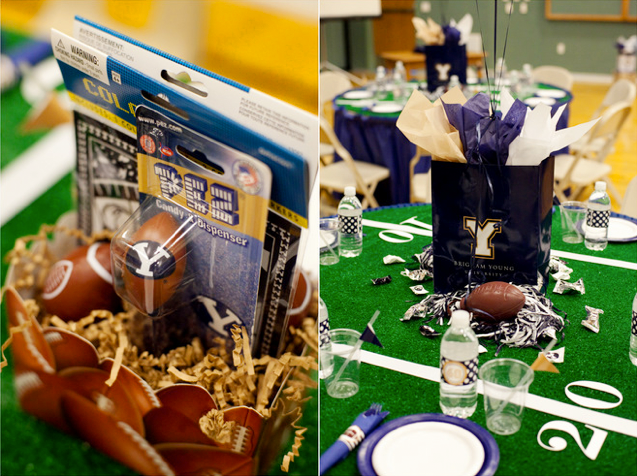 Each place setting on Jennifer's guest tables was outfitted with drink flags, water bottle wraps and napkin wraps from the football collection in BYU's team colors. Jennifer says, "I love it when professionals collaborate to make an event even more amazing!" I agree, Jennifer. Fabulous job and thanks so much for sharing with all of us! This is all just awesome!!! loving these awesome party ideas! I am dying over this awesome party!!!! I married a Ute and don't think I will EVER be able to do this. What a fun party! My son had a Ravens theme football party back in August for his 3rd birthday. Would you share this here? Our companys products are PVC pipes, PVC riser pipes, PPR pipes, PE Pipes, PPRC Pipes, PVC column pipes, PVC plumbing pipes, UPVC pipes, & Water Storage Tanks and All type of pipes fitting, Supplier, Wholesalers, exporters & manufacturers in India. This is fabulous--and I'm sure my favorite little football fan (with a birthday coming up) will love it even more than I do! Thanks for sharing this Amanda! I'm just now seeing it, all these months later! Your printables were a hit! Our companys products are PVC plumbing pipes, PVC pipes, PVC riser pipes, PPR pipes, PEX Pipes, PPRC Pipes, PVC column pipes, UPVC pipes, Water Storage Tanks and All type of pipes fitting, Supplier, Wholesalers, exporters & manufacturers in India. Specialized in PPR Pipes, PVC Plumbing Pipes, Plumbing pipes,PVC Plumbing Pipes Supplier, Wholesalers, exporters & manufacturers in India.